Please confirm the reservation of the plan here. 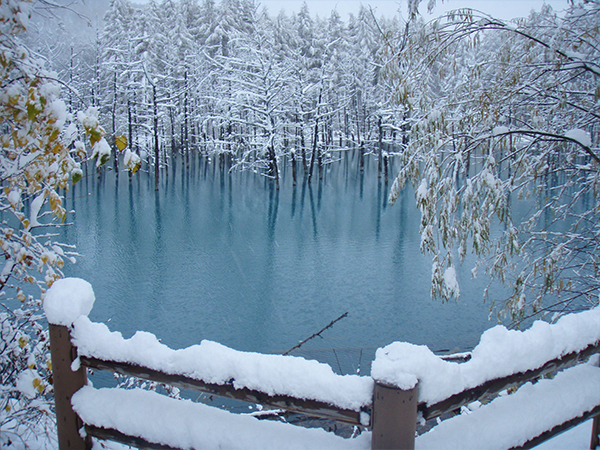 This course is taken from [Hotel Naturwort from Furano], ★ Enriching from Biei-cho to Furano city This winter is the most recommended tourist roundabout bus. The first visit to Biei town departs to the [Shirogane Blue Pond] where the popularity concentrates year by year in a mysterious color pond. Next, you will see a [Shirahige waterfall] with a falling height of 30 meters and an altitude of 600 meters. After that, after the shopping of the blue pond related goods with 【Road station stationery "Shirogane Birke"】, after the shopping etc., to the [Biei shrine] which is called "Hokkaido three major power spot". This shrine is said to have a benefit for love fulfillment and marriage. Next I will visit "Miyama Pass Art Park" where there are "Trick Art Museum" where works using visual illusion were displayed. For lunch, please enjoy the 『Musée Furano of Kamifurano pork』 lunch at GOTO SUMIO MUSEUM, which stands in the field of scenic hills. (※ Customers who can not pork can change to fish dishes) ※ It will be a late lunch. After lunch we will head to Furano Marche in Furano city. You can enjoy traveling shopping and after-dinner sweets at a compound commercial facility that sends out "Furano's farm and food charm" such as Furano production center and sweets cafe. After that, the bus will be sent to JR Furano Station, Hotel Naturwald, Furano Prince Hotel, New Furano Prince Hotel and the customer. ※ When making a reservation, please select at 【place to get off] in (question column from facility). ※ Please gather at least ten minutes before departure. ※Please gather by the time. ● Application deadline / Operating day till 6:00 on the day. ● Tour operator / I will not accompany you. ● The getting-off place is specified in advance. Please note that you will not drop in at a hotel without reservation designation. ● Up to 1 preschool child per adult and 1 child / primary school student if preschool children use the bus seat. ※ If you can not cook pork, please contact "until 15 o'clock the previous day"
Please bring a reservation confirmation email of OPTBOOKMARK.JP. ※ The itinerary may change depending on the conditions of congestion at each facility or road, or may not be able to get on the train to be connected.